Composition: fish and fish byproducts, cereals, yeasts, vegetable protein extracts, molluscs and crustaceans,oils and fats, vegetable by-products, algae, minerals. 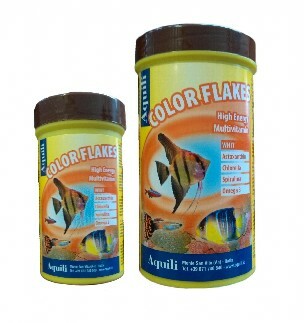 Aquili Color Flakes is the complete staple food, which increases the natural coloration of aquarium fishes. It does not cloud the water. 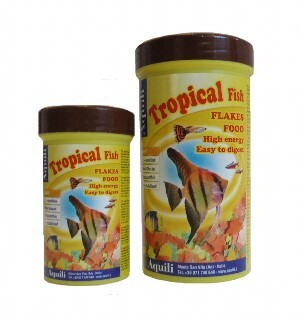 Composed by 5 differente types of flakes it is ideal for a healthy, balanced diet. Analysis (%): Protein: 45% - Fat: 5% - Fibre: 2% - Ash: 7% - Humidity 8%. Nutritional additives/kg: Vitamin A: 25000 IU; Vit D3 1500 IU ; Vit. E 450mg; Vit. C 100mg. Composition: fish and fish by-products, cereals, yeasts, vegetable protein extracts, molluscs and crustaceans,oils and fats, vegetable by-products, algae, minerals. 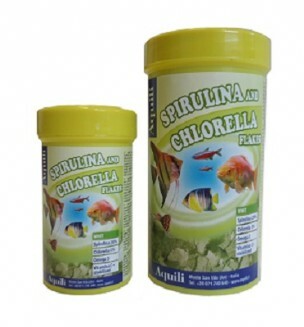 Aquili Spirulina and Chlorella Flakes is ideal for a healthy, balanced diet. Analysis (%): Protein: 48% - Fat: 5% - Fibre: 2% - Ash: 7% - Humidity 8%. Nutritional additives/kg: Vitamin A: 25000 IU; Vit D3 1500 IU ; Vit. E 100mg; Vit. C 2000mg. Composition: fish and fish by-products, cereals, yeasts, vegetable protein extracts, molluscs and crustaceans,oils and fats, vegetable by-products, algae, Spirulina and Chlorella, minerals. 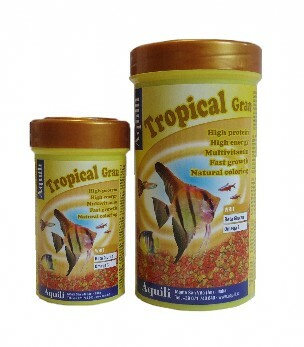 Aquili Tropical Gran is the complete staple food, ideal for all types of aquarium fish. Composed of grains rich in protein and vitamins it is ideal for a healthy, balanced diet. 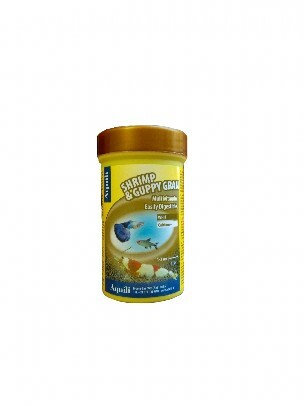 Aquili Shrimp & Guppy Gran is the complete staple food, ideal for for all shrimp and crabs fresh and salt water and all the small fish (1-3 cm). Analysis (%): Protein: 37% - Fat: 6% - Fibre: 2% - Ash: 10% - Humidity 2%. Nutritional additives/kg: Vitamin A: 25000 IU; Vit D3 2800 IU ; Vit. E 330mg; Vit. C 220mg. 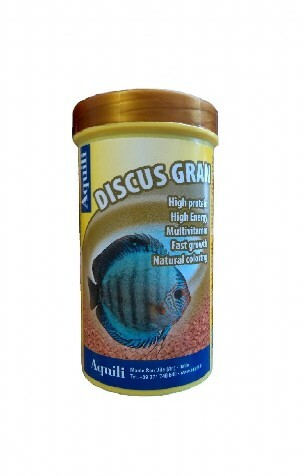 Aquili Discus Gran is the complete staple food, ideal for Discus. Vitamin A: 23000 IU; Vit D3 2500 IU ; Vit. E 300mg; Vit. C 300mg. Composition: tubifex, fish and fish by-products, cereals, yeasts, vegetable protein extracts, molluscs and crustaceans,oils and fats rich in Omega 3, vegetable by-products, algae, minerals. 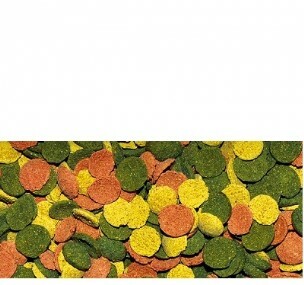 Aquili Goldfi sh Flakes is the complete staple food, ideal for goldfi sh and other coldwater and pond fi sh. 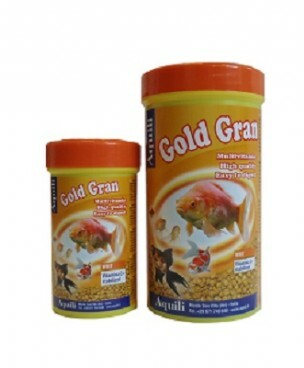 Aquili Gold Gran is the complete staple food, ideal for Goldfish and for all pond fishes. 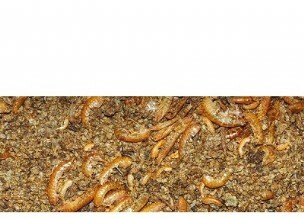 Aquili Natural is a complementary natural feed, ideal for all fishes, aquatic turtles and terrarium animals; with a high Calcium content (6%) essential for the development of carapace, and Phosphorus. Accurate methods of drying, storage and packaging maintain unchanged its natural properties. Composition: natural food composed of daphnia, gammarus, larvae chironomus. 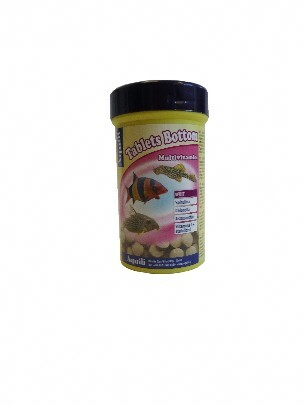 Aquili Tablets Bottom is the complete staple food, ideal for all types of bottom fish. 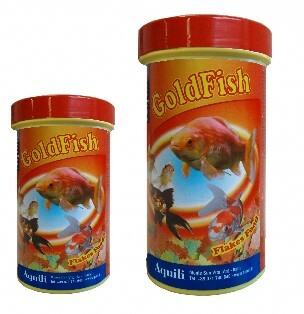 Aquili Wafers is a complete feed, composed of submersible disks ideal for all bottom fish and crustaceans.